We’d love your help. Let us know what’s wrong with this preview of Shadow Climber by Mickey Zucker Reichert. In the second sword-swinging novel in The Bifrost Guardians series, thief-hero Taziar Shadow Climber and his comrade, the barbarian lord Moonbear, take on all challengers--from the cunning villain who destroyed Taziar's father to the Jaderank sorcerer who thirsts for Moonbear's blood. 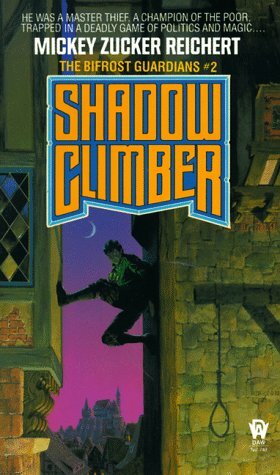 To ask other readers questions about Shadow Climber, please sign up. I read this book when it was new and was disappointed by it. I can't say that I remember anything about it at all, but when it was new I was thirteen, and I can't really replicate that headspace any more either. So basically I would not recommend this book for a thirteen-year-old, though it boggles the imagination to think that a thirteen-year-old would read this review and be swayed by it. Anyway, if it happens, dear hypothetical teenager, be warned. Though of what I can't say. Mickey Zucker Reichert (pseudonym for Miriam Susan Zucker Reichert) is an American fantasy fiction author of several best selling novels. Perhaps her most famous work is the epic Renshai series, which offers an intriguing perspective on traditional Norse mythology. She is also a parent and paediatrician with a soft spot for critters great and small. She has been known care for a veritable zoo of c Mickey Zucker Reichert (pseudonym for Miriam Susan Zucker Reichert) is an American fantasy fiction author of several best selling novels. Perhaps her most famous work is the epic Renshai series, which offers an intriguing perspective on traditional Norse mythology. She is also a parent and paediatrician with a soft spot for critters great and small. She has been known care for a veritable zoo of creatures, at times including mice, horses, snakes, llamas, parrots, squirrels, possums, and foxes.